Leonard Rutgers is a historian of religion and an archaeologist. He is a full professor in the History and Art History Department at Utrecht University in the Netherlands. There holds a chair in Late Antiquity–the only one of its kind in the Netherlands. Leonard received his Ph.D. at Duke University in Religious Studies in 1993. His award-winning dissertation The Jews of Late Ancient Rome was published by Brill in 1995. This book is available as paperback in Brill’s Scholars List. 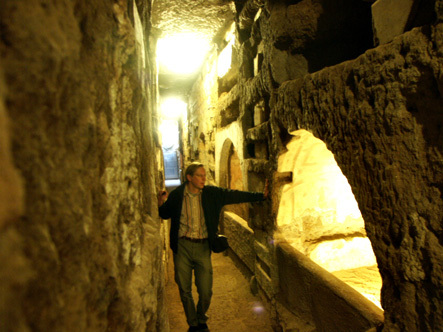 Since then he has directed archaeological fieldwork projects in the Jewish and early Christian catacombs of Rome and in Venosa in Southern Italy. Leonard is particularly interested in the history of Diaspora Judaism and in the mechanisms that underly the rise of Christianity including questions relating to the history of Jewish-Christian relations. Over the years, he has also worked together closely and systematically with scientists. This has resulted in groundbreaking publications such as the ones that appeared in Nature of 2005 and The Journal of Archaeological Science of 2009.